If you keep a gluten-free diet, you don't have to sacrifice your love of tasty crepes for breakfast, lunch, or dessert with this recipe for tapioca flour crepes. These gluten-free crepes are also sugar-free, so you can watch your sweet intake at the same time. 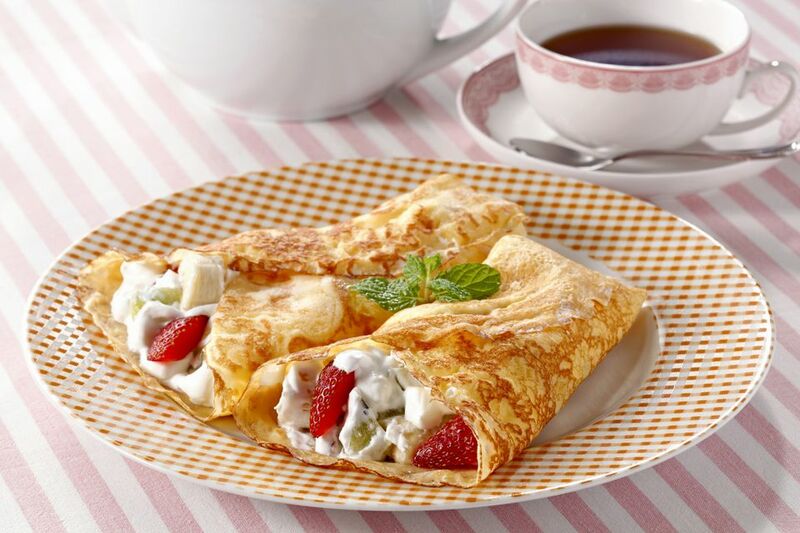 Crepes are a French favorite enjoyed all around the world. Traditional crepes, which originated in the Brittany region of western France, are made with buckwheat flour, which was one of the only grains that could easily grow in the region during the 12th century when crepes were first created. This simple staple has evolved over the years with cooks playing around with different fillings and toppings, from sweet to savory. While tapioca flour is a departure from the original buckwheat flour in traditional crepes, these gluten-free tapioca flour crepes are sure to satisfy. Beat eggs with a fork in a medium-sized mixing bowl. Beat in water, vanilla, and tapioca flour. The batter will appear very liquidy. Let sit for 5 minutes. Heat up a crepe pan or low-sided skillet brushed with oil over medium-high heat. The pan should be just hot enough that a drop of water sizzles and jumps across the pan. Holding the pan by the handle, pour about 1/3 cup batter into pan and quickly tilt all directions, swirling the batter to form a very thin, round layer of batter. Cook crepe for 1 to 2 minutes on the first side, then carefully flip with a spatula and cook for about 40 seconds on the second side. Gently remove crepe from pan and place on a plate, stacking as you make more and keeping them warm until ready to fill and roll. Serve filled with fruit compote, Nutella, or another sweet topping of your choice. Top with a sprinkle of powdered sugar if you wish. You can also fill with savory ingredients such as ham and cheese. Tapioca flour, also known as tapioca starch, is a grain-free flour made from cassava root, a shrub native to South America. It's a staple in gluten-free baking and can be purchased online or at your local health food store. Making crepes can be a bit challenging—the pan, the heat, and the wrist technique are all important to making a perfect crepe. Don't get discouraged if the first crepe comes out a bit burnt, lumpy, or just not quite right. Keep on at it and eventually, you'll master it!